Set in London and Essex, The Informant is a story of ruthless criminals, corrupt cops, obsessive love and the villainy that operates on both sides of the law. Six years later she's released on licence. Clean and sober, and driven by a secret passion for her lawyer, Helen, Kaz wants to escape the violence and abuse of her Essex gangster family. Joey is a charming, calculating and cold psychopath. He worships the ground Kaz walks on and he's desperate to get her back in the family firm. All Kaz wants is a fresh start and to put the past behind her. When Joey murders an undercover cop, DS Nicci Armstrong is determined to put him behind bars. What she doesn't realize is that her efforts are being sabotaged by one of their own and the Met is being challenged at the highest level. http://Lizzy11268.booklikes.com Liz Loves Books.Com. 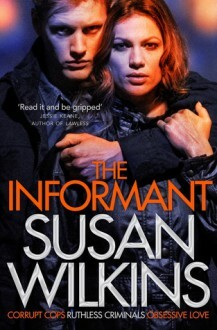 4.0 The Informant by Susan Wilkins - Review. text The Informant by Susan Wilkins - Review.